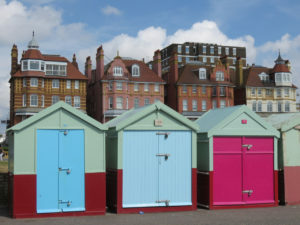 During our stay on the English Channel we had a chance to visit a new tourist attraction in the city of Brighton that might owe at least some inspiration to the Seattle icon. Both the Space Needle and the new British Airways i360 resemble a flying saucer on a tall stand. 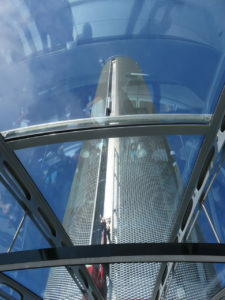 However, to reach the saucer level of the Space Needle you take an elevator 520 feet up to the observation deck. 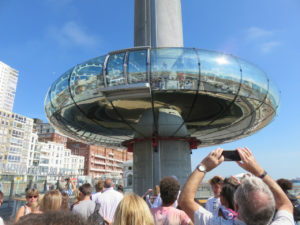 But the glass viewing dome of the i360 descends to ground level to pick up a load of up to 200 passengers before ascending 450 feet to its perch over the waterfront. The i360 is the world’s only vertical cable car. It was designed by the same architects who created the popular London Eye Ferris Wheel, located on the River Thames. 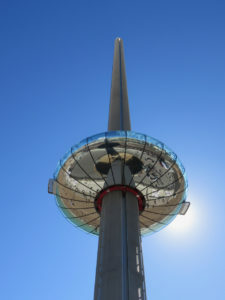 The i360 made its first “commercial flight” on August 4th. Laurie and I stepped aboard about three weeks later. Because British Airways is the naming rights sponsor the staff and attendants sport airline uniforms—although space suits might have been more appropriate. A ticket for a normal excursion—available only as round trip tickets—runs 15 British Pounds. As of this writing that is approximately $18.62. An elevator ride on the Space Needle is $22. Those are also only available as a round trip even though a number of skydivers have only used the elevator for the ascension in the past. The weather when we were staying on the coast was spotty so we watched the forecast and booked a trip for a time when it looked like it would be clear. An ascension into the mist didn’t excite us, especially at those rates. When we entered with our fellow passengers we headed for a clear spot next to the walls of the viewing dome. I was hoping to get some nice shots of the city and coast. Other passengers headed straight to the bar to get a glass of locally produced sparkling wine, ale, apple juice or another treat. I didn’t price it, but figured I would be much better off buying whatever I wanted to drink back on the ground. 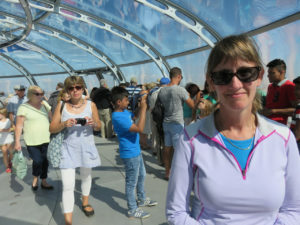 The viewing pod stops several times on the way up to the 450-foot apex so you get different vantage points. Unlike the Space Needle, it doesn’t rotate. 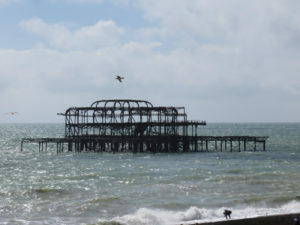 You get great views of the Brighton Pier, the ruins of the West Pier, and the beach itself. Unfortunately, even though the Italian made glass is clear and clean it distorts photographs. I found myself wishing that they had windows that opened so you could get unhindered views. Like the time in Hawaii where we took a helicopter ride with the doors off to get clear shots. Despite the lack of beverages and an open window we enjoyed the flight, but at those rates, once was enough. 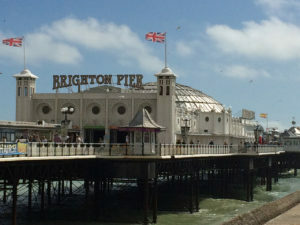 Fortunately for us a walk on the beach or the pier cost us nothing, and last far longer. The story of how the i360 was built is fascinating. See their website for details. The Christmas season is a great time for us to catch up with our friends and family. But as usual I outsourced that task. 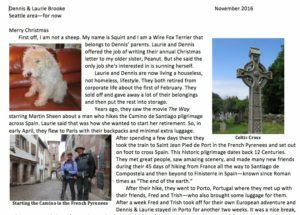 If you’d like to read our Christmas Card, penned for us by a dog, please click here.